The Age, 26 January 2011. MORE than a dozen former Australians of the Year have sparked a fresh debate on the national flag, saying the time for change is long overdue. Join the Australian flag debate here. The current design was a source of confusion overseas and considerable embarrassment at home, Patrick McGorry, the outgoing 2010 award winner, said yesterday. 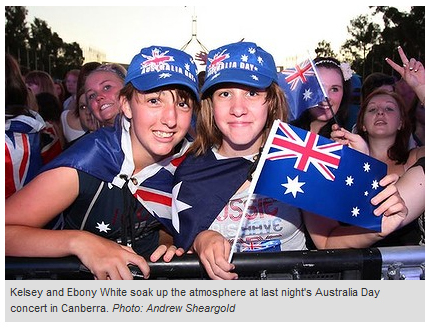 "It′s time Australia grew up. Right now, it′s a bit like a slowly maturing Generation Y adolescent, a 27-year-old who just won′t leave home," he said, calling on the nation to move belatedly into "independent adulthood". Professor McGorry, a mental health expert who believes a new flag is now an "achievable goal" on the way to the greater prize of a republic, is one of 15 former winners to have signed a statement calling for change. Other signatories include clean-up campaigner Ian Kiernan (Australian of the Year 1994), swimmers Dawn Fraser (1964) and Shane Gould (1972) and scientists Sir Gustav Nossal (2000), Ian Frazer (2006) and Tim Flannery (2007). Ausflag, which drafted the statement, believes it can secure support from other award recipients, including runner Cathy Freeman (1998). It is understood only a few of the previous winners approached withheld support. "This is a major breakthrough, backed by some of the nation′s most respected people," said Harold Scruby, who founded Ausflag in 1981. "We must boldly take the next step and define ourselves confidently and distinctly before the world. Our new flag must be unambiguously and inclusively Australian, representing all of us equally. "We believe the time has come to embrace a flag worthy of our sovereign, independent, mature, egalitarian nation; our own flag." 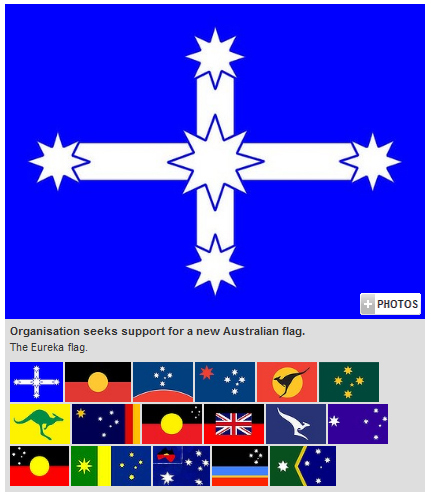 The proposal, which comes after a series of unsuccessful moves to replace the flag, calls on Parliament to produce a design which, "like our national anthem, can be put to a plebiscite of the Australian people". Supporters concede that, like devising an acceptable model for a republic, designing a flag to meet Australia′s needs will not be easy. "So much mythology is involved that a redesign will always be contentious," said Mr Kiernan. Ausflag alone has promoted three design competitions: in 1986 leading up to the bicentenary; in 1993 after Sydney won the right to host the 2000 Olympics, and in 1998 in the run-up to the new millennium. Not surprisingly, though the signatories insist the process should not be divisive, they have different views both on the shortcomings of the present flag and the design of what might replace it. For example, retired public administrator Lowitja O′Donoghue (1984) said the current design "symbolises dispossession and oppression...represents a monoculture and intolerance" towards indigenous people. But she does not propose replacing it with the Aboriginal flag. "We have lost so much, I′m afraid. We don′t want to lose our flag," Dr O′Donoghue said. Professor McGorry said: "I am sure some people will say, ′Oh, this is not the time, Australia has other priorities.′ But that′s pathetic. Governments can deal with dozens, hundreds of issues at one time. We can walk and chew gum at the same time, you know."